In November 2017, I visited the German city of Hamburg to play a few games as part of a group of four enthusiasts. We’d picked it because of strong recommendations from friends but, as usual, we’d opted to pack in as many rooms as we could. I built up the list of games via friends’ recommendations, TripAdvisor ratings and – a new technique for me which worked well – messaging random strangers (who’d reviewed multiple locations on TripAdvisor). 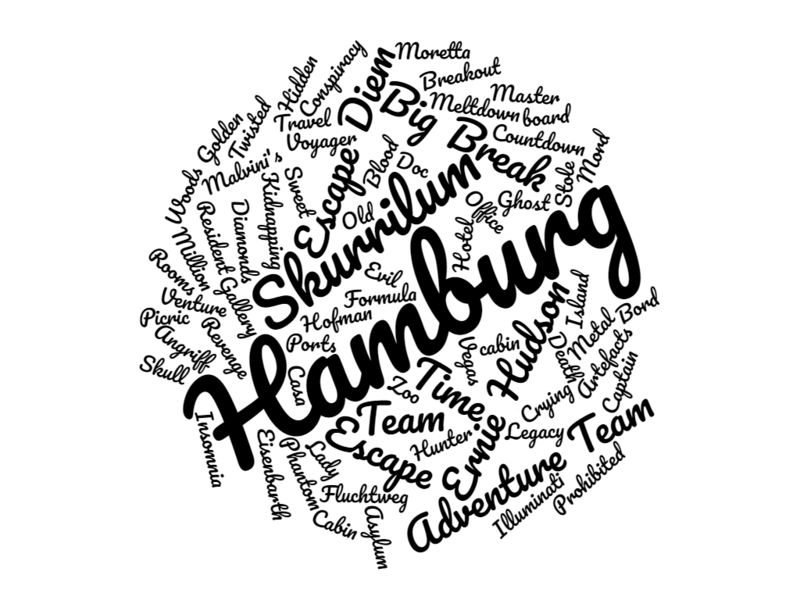 If you’re heading to Hamburg and looking to play a few games, then hopefully this series of posts will give you a leg-up on the research! Most of the venues are pretty walkable from the centre (for a map to help you plan, click here), but we used the metro on one day when we were bouncing round between venues, and Ubers on another when we had just a couple of longer journeys and the weather wasn’t great. Similarly, the ride in from the airport is cheap and easy – right into the heart of town – so, from a transport point of view, it’s an easy city to play in. As for the games, in summary, we found Hamburg to be the highest quality we’d seen in any European city. To put it in perspective, I’d say there are around 13 games of the same quality as London’s top 5. Several rooms were five star, and a couple of those were that special level that make it worth travelling to the city for. The standard of English was pretty much perfect throughout, although several of the games can only be played in German – sadly including a couple of the best. GM-ing was also good quality – we had the odd mis-set and frustrating experiences while we waited for clues, but no more than I’d expect elsewhere. In summary: Skurrilum was the best venue in the city. We played four of their games, which were all excellent (warning: one isn’t technically available in English, but they translated it specially for us, and the one we didn’t play is absolutely German-only). The three games from Hidden in Hamburg on the Captain San Diego were excellent (but don’t play the two on the Rickmer Rickmers!). If you wanted to pick the best five games in the city, I’d suggest Skurrilum’s Ernie Hudson pair, then the three Hidden in Hamburg/Captain San Diego games. After that are Skurrilum’s Malvini’s Legend and the Phantom Island. Other highlights (in no particular order) include: Adventure Team‘s They Stole a Million and Countdown to Meltdown, Big Break‘s Time Travel and Insomnia, and EscapeDiem‘s Harbour Master’s Office. Note that each of those locations has other games – absences in this list don’t indicate that we thought they weren’t good; just that we didn’t play them. While it wasn’t a game that I personally loved, I think there’s also a lot of merit in Team Escape‘s Sweet Revenge if you want to try something different. Finally, I’d also recommend a game we didn’t play: Team Breakout‘s Lost in White. We played the same design in Budapest and enjoyed it. If anything, from a quick peek inside the door, this version looked better. Since I visited, some more games have opened up that I expect to be good based on the venues: There’s a new Hidden in Hamburg (Neptune’s Curse) that the owners tell me is as good as their three games on the San Diego. EscapeDiem has added the Hidden Chapel (and also have Jigsaw which we didn’t play during our visit due to a lack of time). Adventure Team has launched Time Doctors which we just missed out on during our visit. I hope you found this write-up useful. If you did, then please let me know via email, and that will encourage me to write more in future. If you’ve got opinions on the above or, equally, if you’ve found some other gems that people should take a look at, do drop a comment below. Could you give advice on the best country for English friendly escape rooms? (other than the UK of course). I can’t properly advise on the best country – I’ve not travelled extensively in any of them. I tend to visit the major cities (and for cities, Hamburg would be my recommendation). From what I’ve heard, the Netherlands would probably be the right option. Lots of games, very drivable and a great reputation. I plan to do a tour there in May so look out for that write up and it might have more useful advice.